Does Lightning Bolt kill Sunscorch Regent? I have no problem playing against Voltron I've just never been a huge fan of playing it myself. 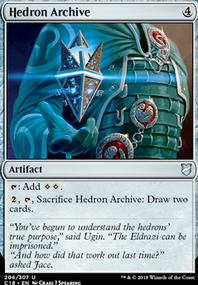 Voltron decks are interesting. Just not my particularl style. I'm glad to see my explation of Sun's Champion helped out a little! Even though I love the card, and it has a very special place in my heart (one of the first Planeswalkers I ever opened) I sadly had to cut it long ago. I do like Tablet of the Guilds . It's an interesting card that I honestly didn't know existed. I may slot it in just to test in out and see how things go. You're completly correct about Eight-and-a-Half-Tails ! I was so tired last night while typing my reply back that I didn't even process it said "Permanent" and not creature. This card may make the list after all. Thank you! I was thinking of making a cut for Archangel of Thune and you may be right about Divinity of Pride . It's one of those cards I've played with since the first edition of this deck so it just kinda blends in. I'll definitely slot it in and give it a try. I still stand fairly firm on Sunscorch Regent , but I may also slot him in to see if he's actually better than I'm thinking. I'll let you know. Elesh Norn, Grand Cenobite has done a surprising amount of work in this deck actually. That may just be because of my meta, but I love having her in the deck. She's a good card that's caused me to win more than one game. As you said, that -2/-2 static ability is a power house! Once again thank you for your suggestions and the replies. I'll definitely test some of these cards out and let you know. Feel free to comment here or message me if you want to discuss anything! Thanks for giving me some insight on your choices. Most important with commander is that you play what you love most. Voltron is definitely a style you need to like and I'm not even sure if Karlov is the best commander for the job, since he has no build in protection. I totally agree with some of the explanations you do, even to the point where Elspeth, Sun's Champion is now gone from my decklist as well. Yeah she can win you games, but like you said often killing off Karlov in the proces. Wich for me is reason enough to remove her from the deck. You're completely right on that. Card's like Tablet of the Guilds and Contemplation are really good if you need a lot of lifegain triggers, but less good if you want big lifegain triggers. I think your deck wants big ones, so maybe they aren't the right card for you. If you are totally fine with Karlov dying here and there, then Mother of Runes is also less important, but Eight-and-a-Half-Tails might be a bit different. 78/100 cards in your deck are permanents (including land) and he protects all of them for only 3 mana (if the spell is white only 2 mana). Often he saved my planeswalkers or enchantments and even lands. The other one I am not completely agreeing with you is Sunscorch Regent . Yes it seems like a budget card with a price not reaching 1 dollar, but he does so much work. The turn he hits often results in 4-5 lifegain triggers after, since your oppponents are gonna play spells. Wich also results in a 9/8 with evasion in the form of flying. It's really really good. One other card I would really suggest giving a go is Archangel of Thune . She is an absolute beast and of all the cards we are talking about probably the one with most impact. She can literally win you games the moment she hits the battlefield. You play 24 creatures wich will all benefit from here fast. If she enters when there is a Soul's Attendant she will trigger. She is the ultimate pay off on a stick for any lifegain deck and she has build in evasion and lifegain. I've played Divinity for quite some time and always liked the card. The thing is he is more cute than he makes a big impact. He is difficult to cast (if you have a utility land you are already screwed) and basically he is just an 8/8 flying lifelink. In my opinion both Archangel of Thune / Sunscorch Regent have the ability to make way more impact on the game for the same amount of mana. Wich will actually benefit your entire board state when one of these 2 is out. 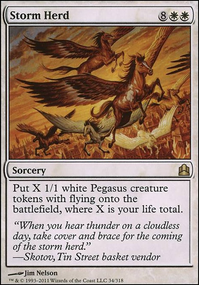 Where archangel will boost all of your creatures and Sunschorch Regent will start triggering cards like Karlov of the Ghost Council , Crested Sunmare as soon as he hits the battlefield (unless he gets countered) but that's the only way he won't give you life. 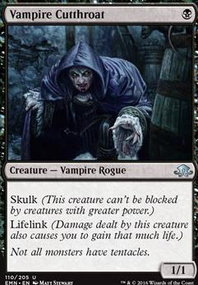 With all the lifegain doubling triggers you play I see him generating more life than Divinity of Pride will ever do it's entire time on the board. This is maybe a bit of a controversial one. But this week I actually cut Elesh Norn from my list. Yes she is amazing, but often she does not survive a round and I found the mana investment way too high to justify playing her. On top of that for me she really felt off place in a lifegain deck. You don't really need +2/+2, so in my opinion the only upside on here is the -2/-2 on the opponents side. That is a crazy good static ability. That being said, I think that Archangel of Thune will do more work for you and maybe already in one turn give more than the +2/+2 Elesh permanently provides. 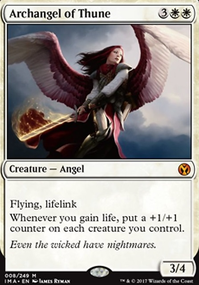 Don't get me wrong, people want to see her go as bad as they do Elesh, but the Archangel just does more for your deck. There is more synergy and eventually more threath wich can lead in the win for your deck. I've played games from being behind to winning the game thanks to her. What to cut for Eight-and-a-Half-Tails I have no idea. I think the 2 slots above are the only 2 flex slots you have in my opinion and since Eight tails is not a bomb like elesh or divinity it's hard to justify a swap like that. I really want to thank you for your big reply I love discussing cards especially when it's about a theme (lifegain) I'm so fond about! Looking forward for your reaction! Cool version of this Karlov build! I enjoyed a bit of different perspective on it! I'm currently playing Karlov for nearly a year now and did a lot of tweaking and tuning. I did find out that he kicks as in a more Voltron role. Before I also played all the "if you have X or more life you win the game effects" but those turned out way to weak and often they were removed before I could get into my upkeep. So I've decided to drop all of those and give Karlov a whole range of protection spells, so often he is unblockable and as you already know it's very easy to get Karlov big. Swing in and go for commander damage, its much more effective than the other effects. Also Karlov does not really care about big heals, he wants small heals and lots of em. Bellow ill post a list of cards wich really benefits my deck. Also I would take Elspeth, Sun's Champion over Elspeth, Knight-Errant . Elspeth is one the few planeswalker who can win you a game by herself. Other planeswalkers are often in a more supportive role. Maybe Ajani, Caller of the Pride might be interesting as well. Let's you swing with karlov with flying and double strike, often resulting in a game end for one player. Path of Ancestry While this comes into play tapped, so don't a ton of the lands you are using. It still produces any color even if you don't use it on a dragon, you just don't get the scry. Sol Ring This has a good case as the best card in commander. 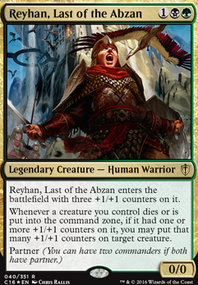 While it doesn't help cast your commander, it does get Explosive Vegetation or Circuitous Route cast on turn 2. 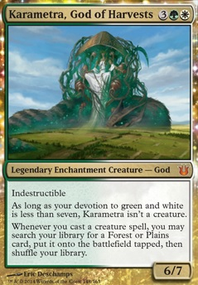 Kodama's Reach and Cultivate would be great includes here as well [both also came with the deck]. Green is played for this kind of ramp. Sunscorch Regent You wouldn't want these abilities on your commander? Or have it on the battlefield attacking next to it? Crux of Fate is a one sided board wipe for you. Coupled with Hellkite Charger Savage Ventmaw gives you back most of the mana you need to pay for another attack phase. And that is a pretty wonky mana chart... while not in the pre-con, Exotic Orchard should always produce something you can use. Any of the taplands like Cinder Barrens could become the appropriate guildgate and then you could go for a Maze's End win as a back up in case you find yourself locked out of attacking. Add Crop Rotation to fetch Maze's End and use the Maze to fetch guildgates. 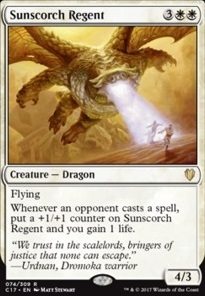 Ever thought about running Sunscorch Regent? He works in my Karlov's Will like an absolute beast, especially if you play multiplayer.